Are you trying to find work trucks for sale at Milwaukee Chevy dealers that are affordable offer plenty of power to get tough jobs done? Then check out what we have to offer you at Ewald Chevrolet Buick, your Chevy dealer near Milwaukee. Drivers everywhere love to shop with Ewald’s Chevy truck dealer near Milwaukee. We make it easy to find and drive away with a Chevy work truck for sale so you can get back to work quickly. You no longer need to spend hours searching Milwaukee Chevy dealers for the work trucks for sale that you want, because the only Chevy truck dealer you need is Ewald Chevrolet Buick. From a Chevy Colorado work truck to a Chevrolet Silverado diesel truck, we have the Chevy trucks for sale you want and need at Ewald’s near Milwaukee Chevy dealers. You can also find many great deals and financing options to go along with our generous selection of work trucks for sale at Ewald Chevrolet Buick. Stop by today and take a look at the new and used work trucks for sale that we are proud to provide Wisconsin drivers and beyond. If you are looking for diesel work trucks for sale, you will surely love our inventory here at Ewald Chevrolet Buick. In Wisconsin, diesel trucks are in high demand, and we know why. In Wisconsin, diesel trucks offer the power and reliability that businesses need to get hard work done efficiently. Chevy diesel pickup trucks, Chevy diesel dump bed trucks, and even Chevy diesel box trucks, you can find them all here at Ewald’s Wisconsin Chevy truck dealership. Are you looking for heavy-duty diesel trucks for sale that can accomplish tough tasks such as hauling rock or other landscaping materials? Check out the new 2019 Chevrolet Silverado 3500HD for sale. 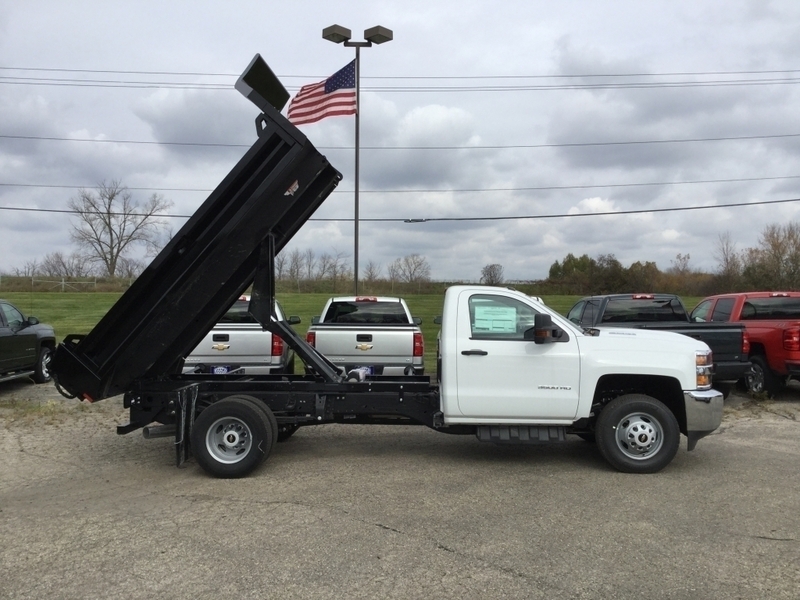 This Chevy diesel work truck is ready to get to the job site and get the task at hand done. This diesel truck for sale has an impressive, factory equipped 6.6-liter 8 cylinder engine that boasts a whopping 445 horsepower and four-wheel drive to handle rough terrain. This Chevy work truck for sale is sure to give you plenty of power and performance on and off the road. You can also enjoy a variety of great features and options on the interior of this Chevy diesel work truck for sale near you. Such as an MP3 compatible radio, an easy to clean vinyl interior, Bluetooth, and a whole lot more! Check out everything else this or another one of our Chevy diesel trucks for sale near you has to offer when you visit us at Ewald’s Chevy dealer near Milwaukee, Ewald Chevrolet Buick! For a closer look at this Chevy work truck for sale or one of our other diesel trucks for sale near you, visit Ewald Chevrolet Buick located here at 36833 E Wisconsin Ave in Oconomowoc, WI 53066! Or give us a call at Ewald's Chevrolet truck dealer near Milwaukee WI at (262) 226-2842. Call to schedule your test drive or with any questions about our Chevy diesel trucks for sale near you today.